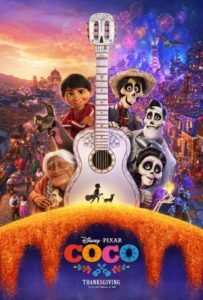 Coco is an action, adventure, and comedy animated film by Disney. Pixar Studios. Miguel, voiced by newcomer Anthony Gonzalez is a young boy living in Mexico and dreams of being a super-star musician like his idol Ernesto de La Cruz, (voiced by Benjamin Bratt). His family has forbidden music as his ancestor abandoned the family in order to peruse a musical career. Miguel is driven to follow his dream despite the family ban and finds himself in the land-of-the-dead. During his adventure, he finds truth, friendship and the courage to become a musician. Coco marks the reunion of director Lee Unkrich and producer Darla K. Anderson following their celebrated collaboration on the Best Picture Academy Award nominee Toy Story 3 (2010). The Bottom-Line? Yes, the set design is gorgeous in the land of the dead, and the family-centered theme is a winner… however, Coco’s story-line didn’t wow me. In a somewhat, slow, lifeless tale of death, Miguel the hero, discovers murder and betrayal, all due to an intellectual property rights dispute. No wonder the younger kids in the theater were yawning and antsy; Coco is suitable not for kids under the age of 7 or 8. The final family scenes are impressive but with a 1 hour 49-minute runtime that’s way too long to wait in a child-centered film. I did love the short (21 minutes) Disney film Olaf’s Frozen Adventure that played before Coco. Parents, be prepared to stay at least 2 and a half hours at the theater. Credits: Directed by Lee Unkrich, Adrian Molina. Written by Adrian Molina and Matthew Aldrich. Stay tuned, more to follow on both films!